It appeared as a very distinct horizontal line across the core, demarcating the upper silty (?) layer from the lower, very dark silty clay. This horizon was detected approximately 240 cmbs and several pictures were taken. Another very clear boundary was detected at around 340 cmbs and it looked to demarcate two silt/loam layers, one very tan, above, and one darker brown below. Unfortunately this line was lost when we were taking the soil core out of the borer. At about 3 meters below surface, we recovered a very wet, swampy clay soil that still had a significant amount of organic material (i.e. leaves, twigs, etc) in it. We bagged approximately one flake from this core (378 cmbs) and we are not sure if it was pulled in from the upper layers. Rachel exposed it to HCL and it gave a petroliferous smell, indicating according to her that it had been buried for some time. C3 has been by far the deepest we have placed a core, finding that using that last and heaviest push rod makes coring quite difficult since it is difficult to carry and to match to the previous push rod. Ultimately, I don’t think it is all that useful to core down through an entire mound since you can pick up strats quite easily in the flank. The only sensible reason to core through the top of the mound is so you can pick up burned or buried floors. This might be a good idea tomorrow in Mound D, where I can place perhaps one in the flank, one on the natural surface in front of the mound, and then one through the top (which perhaps does not need to be characterized unless occupational surfaces or burned floors are detected). This core was placed in the front yard of the house where purportedly Harold Fisk had mapped Channel 5 running from the NW to the SE. I wasn’t very optimistic about detecting any portion of channel 5, but nevertheless, I wanted to see what the soils might reveal. This was an easy area to core, and the Giddings rig penetrated the soils easily. Rachel is convinced of the soil survey map from this area and believes they did a good job in the 60’s mapping the extant soils on the surface landscape. Briefly, it appears the two core lengths demonstrate for some humic soils, and then a very large sand depositional event, such as in a natural levee. Rachel believes that underneath the humic layer (see detailed core logs for depth), there was once the tail end of a natural levee, and that progressing towards the mound the levee was falling into a backswamp. 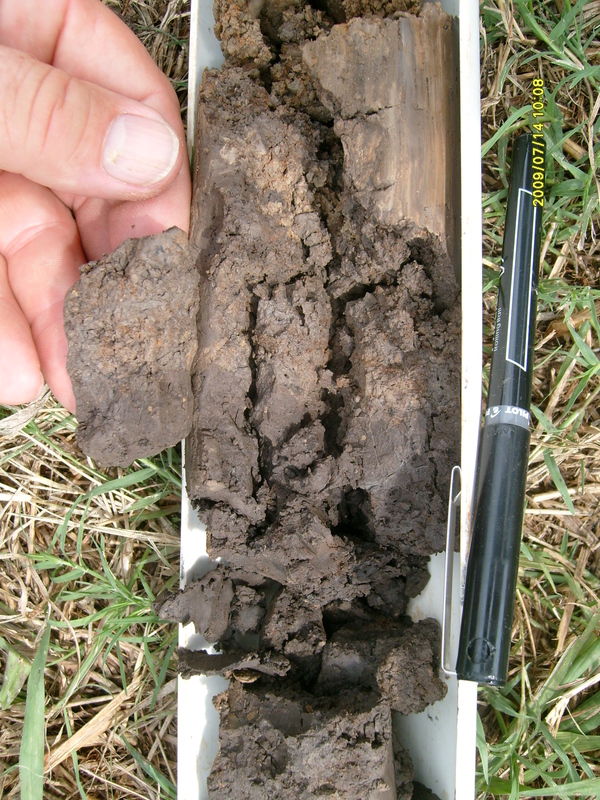 The soils deeper in the second core length appear to have been repetitively deposited without much time to develop – from one flood event to another, with little time for the soils to weather. *Its possible with point bar and ridge/swale topography out across the road from Mound C that channel 5 was mapped incorrectly – the channel may have been farther out or shaped differently. We were looking for data supporting a channel 5 location north of the road and to gain a better understanding of the ridge and swale topography north of the road. Very briefly, the core was plowzone, very compact silt/loam, some silty clays, sands, clays (possibly channel fill) and then some other more sandy soils, but not the blue muds Saucier describes as channel deposits. Rachel thinks the clay plug may represent channel fill but is unsure. Looking around on the landscape, it is not very clear what was happening with the geomorphology – while channel 11 appears very clearly on the landscape, the scar or depression from channel five isn’t very clear – perhaps it is deeply buried. Looking at the soil survey maps, it is apparent that most of the mounds making up Carson are built along high ground that falls off to the north, into Richies Bayou, and to the south into old, not very well drained, deppresional soils. The channel sequence in the area, however, is not so clear. *Thinking about the layout of the Carson site(s), all three complexes of Montgomery, Carson and Stoval, I think the highest likelihood for buried sights might be closest to channel 11, since this is the most recent active channel, and the deepest flood events will have occurred nearby. Perhaps some crevasse splay activity in the area was inundating portions of the site. Both Jay Johnson and John Connaway concur that they rarely found materials on the surface of this site before land leveling.